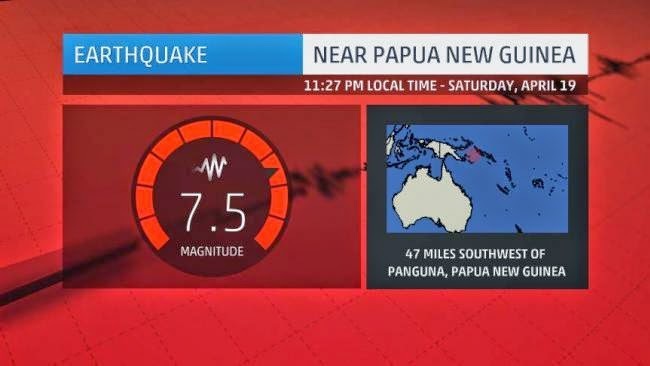 An earthquake struck late Saturday off Papua New Guinea's eastern coast with a preliminary magnitude of 7.5, the U.S. Geological Survey said. The quake struck at 11:27 p.m. (9:27 a.m. ET) and occurred at a depth of 19 miles (32 km), the USGS said. After the quake, the Pacific Tsunami Warning Center issued a tsunami warning for Papua New Guinea and the Solomon Islands, but then canceled it. Saturday's incident is the latest in a series of seismic events in the region over the week. They began with magnitude-7.1 and magnitude-6.5 earthquakes on April 11, just to the northeast and southeast, respectively. Since then, 45 earthquakes of magnitude-4.5 or greater have occurred nearby. Earthquakes with magnitudes between 7.0 and 7.9 are classified by USGS as "major," second only to "great," which are 8.0 and up.